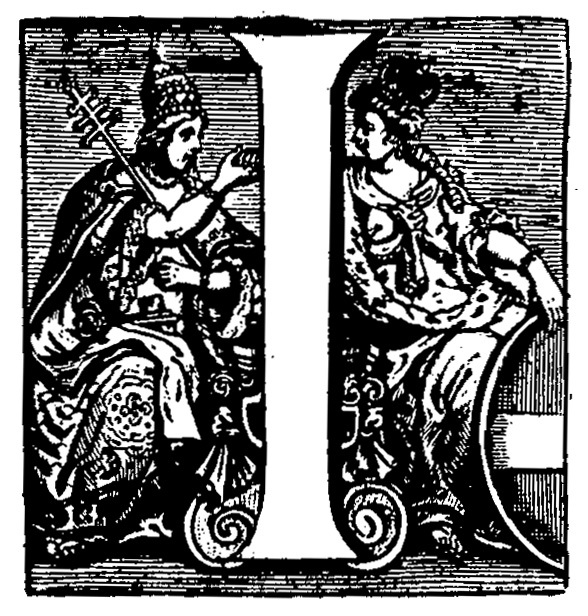 Here are two instances I have found where an "Empress" is not a specific Empress, but an allegory for the Holy Roman Empire. They both post-date the earliest Tarot Empresses by hundreds of years, but I hope they will be of interest to somebody. The second one even has her holding hands with a "Popess", personification of the Roman Church! 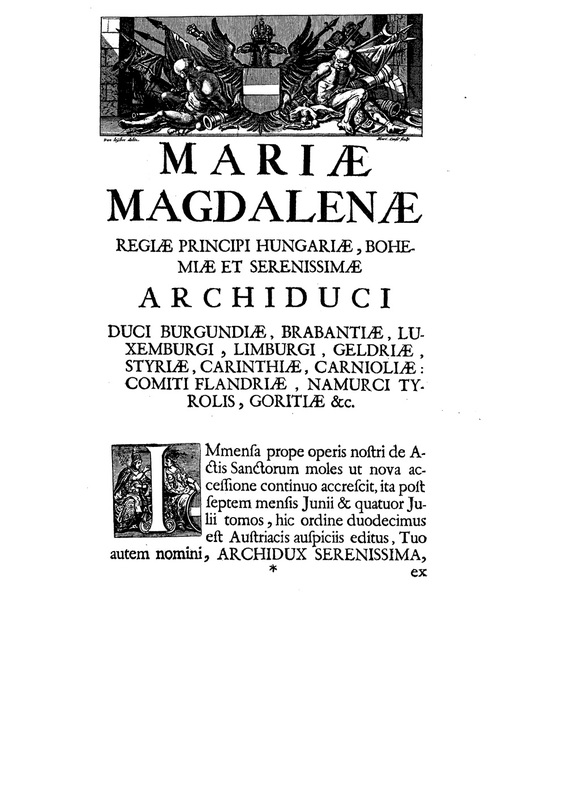 From the dedication of the Bollandist's "Acta Sanctorum", July volume 5 (1727), to Princess Maria Magdalena, sister of Emperor Charles VI (1685-1740). Thank you Ross, the images are both beautiful. 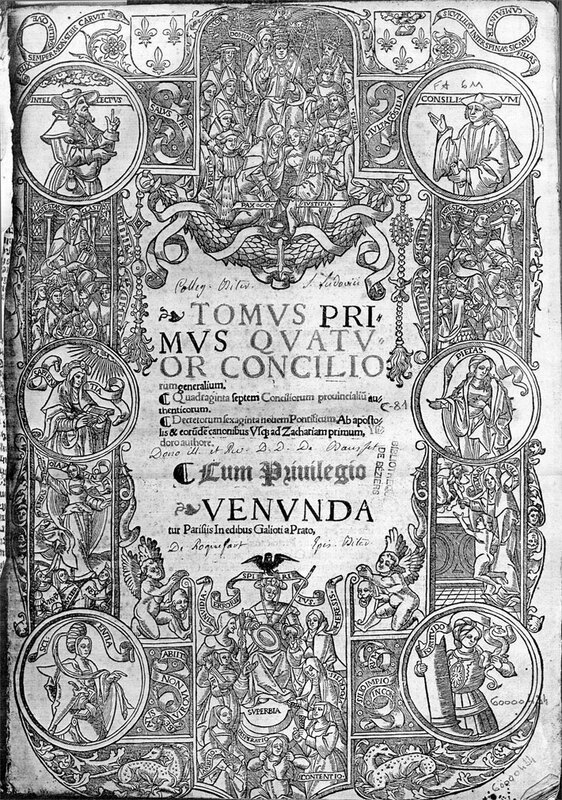 From the banner in the lower part of the page, I understand that the first image represents Potestas (i.e. Power). 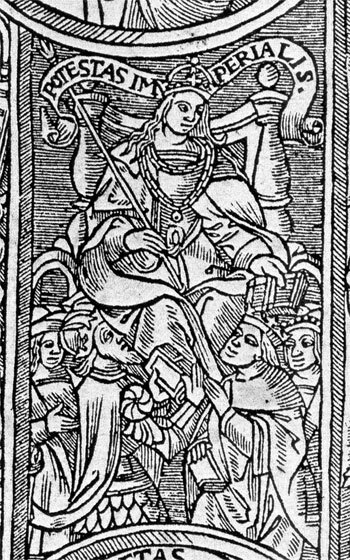 I think you previously suggested that Potestas could have been the original meaning of the Empress. I really like this interpretation, and I find it quite convincing, in particular when the Popess is interpreted as Faith (as from the Giotto Fides in Padua you wrote about) or the Church (as seems to be suggested by the second image). In the first image, it is interesting to note that Potestas is encircled by other allegories. 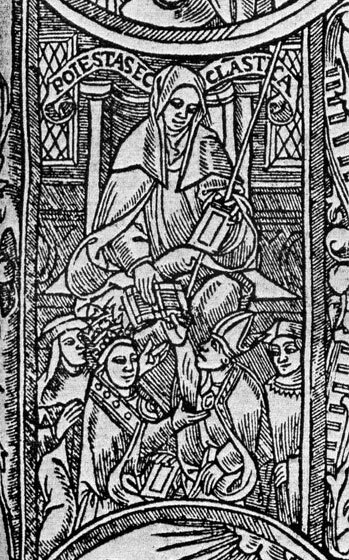 This "tarot-biased" interpretation comes to my mind: Fame (with trumpet and crown, like the Cary Yale "world" card), Faith/Church (though this time she does not look like a Papesse), Temperance (with the elephant, like the Etteilla card, from Ripa Iconologia) and Strength (with a column, like the Charles VI tarot card). The Banner identifies the three figures that are imprisoned in the lower cave as allegories of Envy (the ugly woman on the right), Fraud (with the mask), Tyranny (the man on the left). 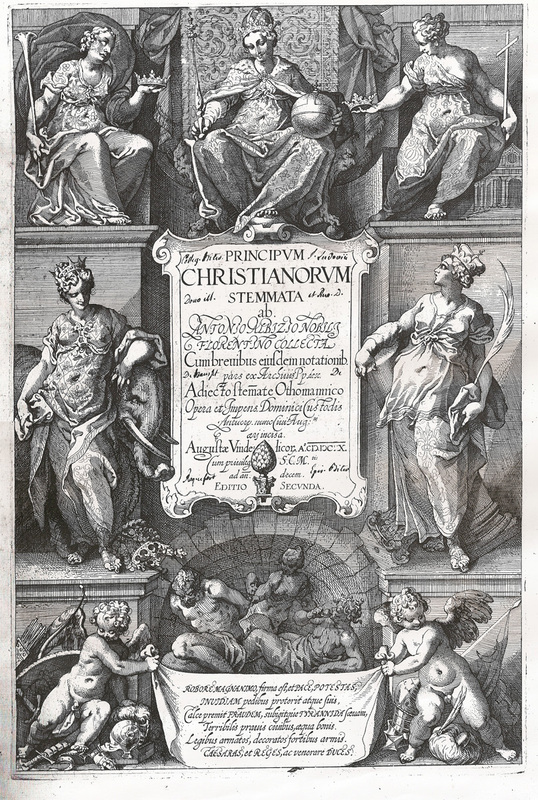 From the banner in the lower part of the page, I understand that the first image represents Potestas (i.e. Power). Thanks for pointing that out! I hadn't even read the banner (you will frequently note that I miss what's right in front of me). I wonder if She is not more "Robore Magnanimo", "by Noble Strength"? But then the nominative is "Potestas", so she is the subject. 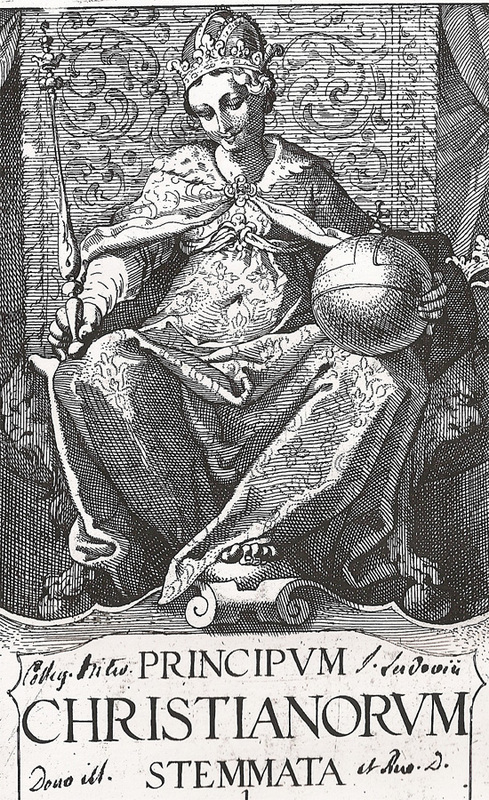 I think you previously suggested that Potestas could have been the original meaning of the Empress. I really like this interpretation, and I find it quite convincing, in particular when the Popess is interpreted as Faith (as from the Giotto Fides in Padua you wrote about) or the Church (as seems to be suggested by the second image). I thought of the elephant figure as "Worldly Glory" (and above her, Eternal Fame), but I didn't think of Temperance. Terribilis pravis civibus, aequa bonis. Legibus armatos, decoratos fortibus armis. CAESARAS, et REGES, ac venerare DUCES. Terrible to the bad citizens, fair to the good. Armed with law, adorned with strong arms. To honor EMPERORS, and KINGS, and DUKES." 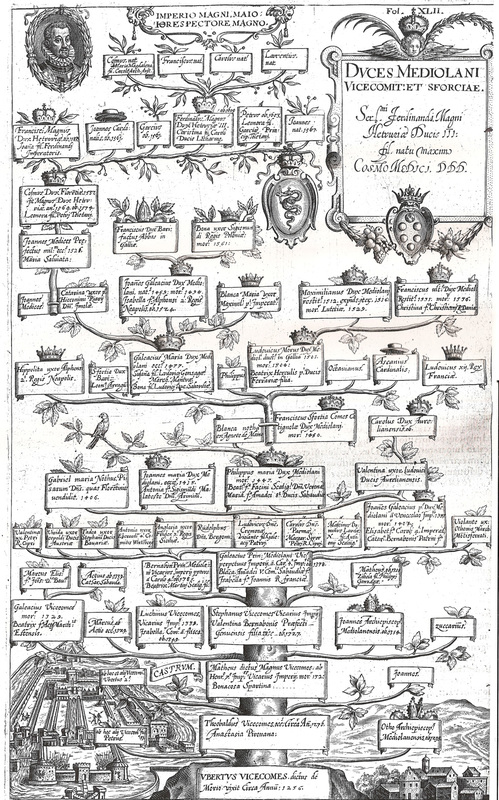 The book is a series of genealogies of noble families of Europe. So the metaphorical meaning of "robur" is used - literally an oak, it also means a trunk, a bulwark, stronghold. The "bad" citizens - (pravis) - depraved, vicious, mean, deformed etc. obviously those portrayed below, in the cave. -Invidiam changed to Envy (from Hatred) on Michael's reminder. Thanks Michael! But the sense of the old vice "Envy" seems better conveyed by "Spite", so I've changed it again. Anyway, you all get the picture. Thank you for the translation, Ross. I was tempted to post one, but there are things I don't understand (e.g. the accusative in Armatos and Decoratos). The girl with the cross could be Peace (?) instead of the Church or Faith....this would explain why she is almost naked. LOL - it's tough. I'm not that good. My translation is rough, a kind of compromise. I wasn't sure to take Armatos and Decoratos as the perfect passive participle or just adjectives. I think it could be either. Taking them as the perf. pass. part, we could say: "To honor those Caesars, Kings, and Dukes, (who were) armed with law, decorated with brave arms." Or maybe just the adjective, without the verbal aspect. "Those Caesars, Kings and Dukes, armed with law and decorated with brave arms: to honor (them)!" Or maybe it is kind of a dedication - "To the honor OF those Caesars... etc." I'm not sure, but I think it's in one of those senses above. It could be that the purely metaphorical meaning is correct. I changed my mind because the book is nothing but family trees, literally shown as trees. So I think the inscription plays on that.